Flower + Gem Essences that are particularly useful during pregnancy, labor and postpartum (to learn more about what Flower + Gem Essences are visit our previous blog post). The great thing about Flower + Gem Essences is that they are good remedies that, by their very nature, can do no harm which makes them wonderfully safe to take during pregnancy. Continuing our journey through pregnancy and postpartum, we've now arrived at labor! CHERRY PLUM "I trust the journey"
Ah, sweet Cherry Plum! Here is an ally for laborer and baby - it guides us to trust the experiences of our journey and to find balance during times of stress and uncertainty. Sounds like it was made for labor, right? Such clever flowers! I find that Cherry Plum is especially good for those who seek to have lots of control in their life. Cherry Plum is a kind massage of a Flower Essence, helping us to gently loosen our grip on our (generally futile) attempts to control all possible variables of labor (and life). Trusting in the greater cycle of life, the lineage of births before us, and the knowledge that we don't know everything is another gift of Cherry Plum. For some folks it is really scary to contemplate labor. For first-time laborers it may be the uncertainty of the unknown or their mental / physical / emotional capacity to go through labor. Other fears arise from previous birth traumas or worry about complications throughout pregnancy leading to complications during labor. Sometimes it is just scary. Borage teaches us that we get scared to know where the fear lies and knowing that fear is often a process of finding our own power. 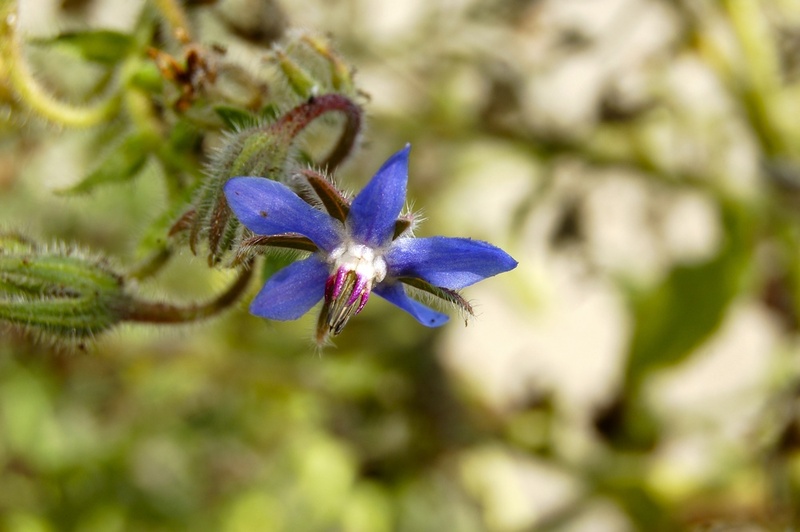 The star-shaped blue flowers of Borage hang from their stems, gazing down at the earth, not fearing the fall, but meeting the journey with an open heart. Take Borage for an infusion of courage during uncertain moments and the most challenging parts of labor to remember that you are, in fact, complete, whole, and full of strength. Mugwort is an excellent ally to move between one stage to the next - a wonderful remedy during transition in labor. The herb is also a guardian of childbirth and easy labors. Mugwort seems to help communicate between parent and baby during labor, helping to psychically guide the child through the birth canal when both parent and baby are ready. As a herb of dreaming, Mugwort also connects us to our most important visions dreams and vision just before and during labor. BLACK COHOSH "I transform disturbances"
For those who have suffered from trauma in the past, especially of a sexual nature, Black Cohosh is an essential ally during the labor process. Labor can be a birthing of many things: a new child, a family, and a (re)birthing of the laborer. Through labor our previous traumas, our hardest challenges, and our most disturbing experiences can sometimes arise, challenging us during some of our most powerful and vulnerable moments. Black Cohosh strengthens our back-bone and resolve to transform cycles of abuse into a wheel of wellbeing. Releasing the built-up congestion of imbalance, Black Cohosh helps us not only confront previous trauma, but to be present to the challenge and joy of labor. WALNUT "I am free from limitations." Ever feel like everyone is so eager to offer their opinions of your pregnancy that it is hard to know what you really want in your labor? Maybe an overbearing Mother-in-Law or a pushy, know-it-all sibling? Labor is a good as time as any to be firm in your resolve and desire for your birth experience. Walnut is your ally to untangle from the limitations of everyone else's opinions, beliefs, and social conventions. Walnut is a guiding star for your labor journey - it helps to attune you to your own internal compass. Like Mugwort, Walnut helps us with the transitions of life, and, in particular, the transition from being swayed by the opinions of all around us to being steadied by the truth of our own experiences and desires. Read our recommendations for the First Trimester, Second Trimester, and Third Trimester. We carry Borage in our Etsy Shop and Poppy Swap Shop. Other Essences can be found from a variety of resources such as the Flower Essence Society and Bach Flower as well as local health food and natural healing stores.